During the 84th Texas Legislative Session, there was a bill passed to cut $350 million from therapy services given through the Texas Medicaid program which serves medically fragile children with disabilities. 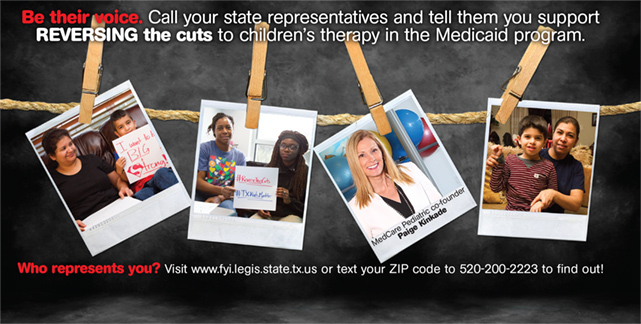 However, the effect that such drastic cuts (28% rate reduction for many services) would have on therapy clinics and home health providers was not studied prior to passing the cuts. These Kids Need Your Help! Tashera Steven’s 17 year old daughter Kianna was diagnosed with ADHD and short term memory issues in 3rd grade. Finally, in 9th grade, she started receiving speech therapy twice a week. It was something Tashera had to fight for. “It was very hard to get services, like pulling teeth.” Today, Kianna’s services have been cut to once a week, even though she is still recommended for twice a week. Adriana Ledesma’s daughter Leah is eight years old with global developmental delay. She merely wants basic age level skills for her daughter, but after six months, she remains on a waitlist for therapy.